The hub is made of ABS plastic materials, complying with FCC and CE Certifications. This JSVER ultra slim hub is designed for maximum portability and convenience when on the go. 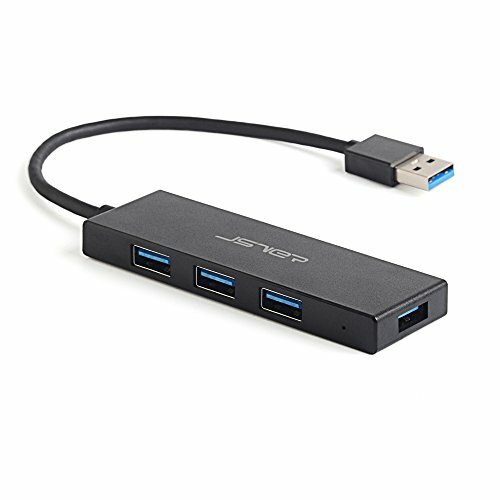 This hub expands your computer with one port to 4 USB3.0 ports, allowing for fast 5Gbps transfer rates (fast enough to transfer a full HD movie in just a few seconds!). Built in Overvoltage/Overcurrent/Leakage and Short-circuit protection unit. The LED indicator shows the hub status. The hub is designed for data transfer. It is not suitable for charging your devices! For a stable connection, please do not connect high power consumption devices such as external hard drives. The hub will sync but not charge tablets and other devices that require a higher power input.